As a gaming site, seeing the duo games booth at CES this year hit a soft spot as I got some time with their iPad peripherals. Luckily, they have provided me with the duo GAMER, duo Pinball, and the ATARI ARCADE. To put bluntly, we got some fun ways to enjoy games on my favorite tablet in ways they were meant to be played, without having to use the touchscreen or miss what is going on due to fingers or hand placement. It is pretty easy to figure out what they are used for and if you're a fan of pinball, 80’s arcade games, and/or Gameloft games, then you may want to see how they fare. I will start with the duo Pinball, which you guessed simulates the pinball experience on your lap or desk. 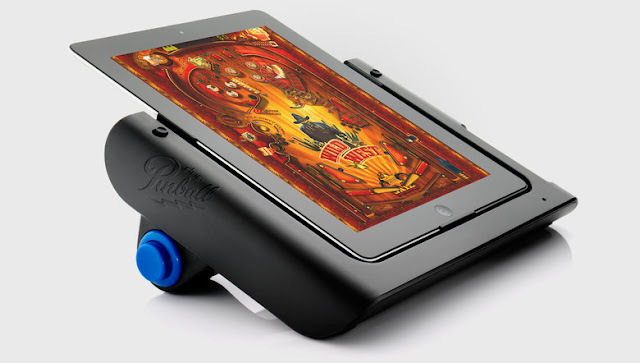 Connecting by Bluetooth and powered by three AA batteries, the pinball cradles your iPad, regardless to which of the three you may have and holds it snugly at an angle. Using the realistic plunger and buttons, the experience is so much more enjoyable and the no slip pads add a great deal of security. What I did not like was the this product only supported Pinball HD, and while it is a good game, Zen Pinball has some great tables and it would just be a lot nicer if it could be used on multiple applications. 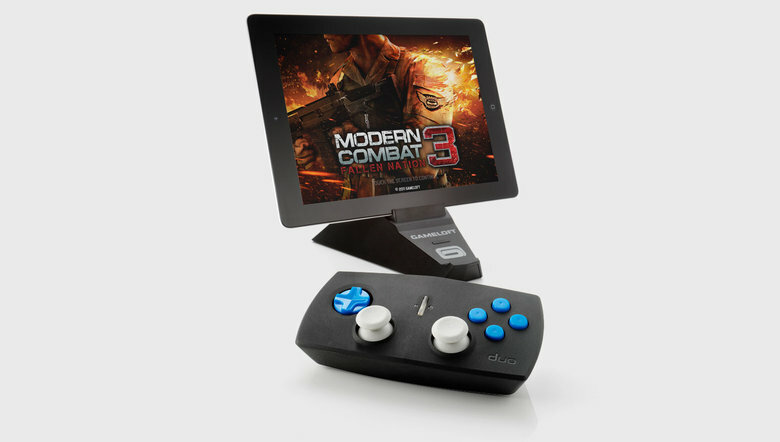 Next up, is the duo Gamer controller and stand to provide a console like experience on the iPad. This, also Bluetooth, controller plays exclusively with Gameloft apps and has the same control scheme as PlayStation and Xbox, minus a pair of shoulder buttons. Playing through the limited selection of games, it did provide the console feel and allowed for a lot more viewable area on the screen. I am going to repeat myself, this does not play on any apps that aren’t from Gameloft, and even their list of supported titles from their large library are supported. If the Gamer supported more titles or developers, it could easily become a must have. I have saved the best for last, the ATARI ARCADE, a desktop arcade that has the capability to play the ATARI games of childhood memories. This is a must have desktop novelty for me and likely most anyone that is a nostalgic gamer and owns an iPad. 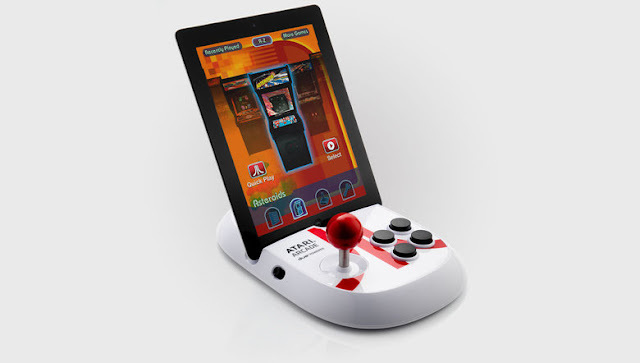 The design is sleek and incredibly solid, with four buttons and a joystick in a white base with a red logo on the top. Surprisingly this does not require batteries so as soon as I could get the Greatest Hits downloaded to play Asteroids, Missile Command, and Lunar Lander. My only problem were how loud the joystick is when it clicks during movement, and that it did not come with all the titles included or at least tokens to try out the majority of the games.